A recent study conducted by Staples found that 90% of employers report encouraging their employees to take breaks, and that 86% of workers believe that taking breaks would make them more productive. Thus it is surprising that the same study found that over a quarter of workers don’t take any breaks other than lunch. And, according to this infographic, only a third of people actually take a lunch break, the rest eat at their desks or don’t break for lunch at all. Why? Many people think they are just too busy to have time for breaks during the day. According to the Staples research, 20% of respondents cited guilt as the reason they don’t take breaks. This Harvard Business Review (HBR) article cites fear of losing momentum and the inability to get back on track as key reasons for avoiding breaks—especially when we feel we’re highly engaged and are working at peak productivity. A recent Buffer post, The Science of Taking Breaks at Work: How to Be More Productive By Changing the Way You Think About Downtime, takes an in depth look at the science behind the benefits of taking breaks. One very interesting scientific observation is that our brain activity actually increases when we let our minds wander. That’s why taking a break when you’re stuck on a problem, and giving yourself permission to daydream or to simply relax, will result in the solution presenting itself—as in the “aha!” moment people often experience in the shower or while they are drifting off to sleep. 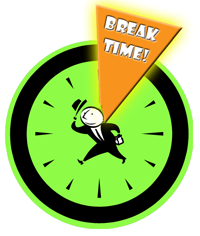 Once you’ve embraced the need for breaks, it is important that you make the most of your break time so that you return from it energized and ready to be productive. This Japanese study found that viewing pictures of cute baby animals (as opposed to adult animals or neutral images) significantly improved participants’ performance on tasks that required carefulness and attention. This infographic provides additional suggestions for break activities, as does the end of the Buffer post noted above. However, according to researcher Charlotte Fritz, you may want to think twice about that coffee break. Her research, specifically related to short work breaks taken during the day she calls “microbreaks,” found that non-work related activity such as coffee breaks or bathroom breaks had a negative impact on energy while work-related break activity such as praising a colleague or drafting a to-do list had a positive effect. So, what can you do as a small business owner to promote break taking that will lead to increased productivity for yourself and your team? The Staples study suggests that improving your break room can go a long way towards helping your employees take more frequent and more productive breaks. This infographic provides details. So, however and whenever you decide to do it— be sure to take a break, or two or three, today. You not only deserve it, but science shows you need it too.